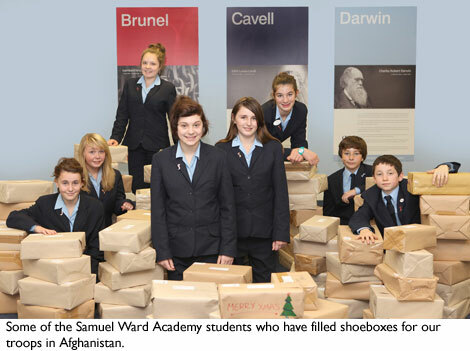 Students at Samuel Ward Academy have been preparing for Christmas by assembling shoe boxes containing gifts for our troops serving abroad. This year the boxes will be destined for 653 Squadron of the Army Air Corps, currently serving in Afghanistan and who are usually based at Wattisham. 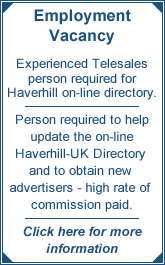 Their helicopters are often seen in the skies above Haverhill. Helen Jones, achievement director at Samuel Ward Academy said: “With the subject of Remembrance in our minds we wanted to show those serving abroad now that they are in our thoughts and prayers and to do something practical for them. "A few luxury items for them at Christmas will be a welcome treat. This is an excellent opportunity for our students to help lift spirits and to make a difference." Students and their families collected together over 100 boxes which have now been despatched in time for distribution at Christmas.